Atheneum Books for Young Readers, 9781481435185, 48pp. From Ezra Jack Keats 2015 New Illustrator Honor recipient Evan Turk comes his debut work as author-illustrator: an original folktale that celebrates the power of stories and storytelling. Long, long ago, like a pearl around a grain of sand, the Kingdom of Morocco formed at the edge of the great, dry Sahara. It had fountains of cool, refreshing water to quench the thirst of the desert, and storytellers to bring the people together. But as the kingdom grew, the people forgot the dangers of the desert, and they forgot about the storytellers, too. All but one young boy, who came to the Great Square for a drink and found something that quenched his thirst even better: wonderful stories. As he listened to the last storyteller recount the Endless Drought, and the Glorious Blue Water Bird, he discovered the power of a tale well told. 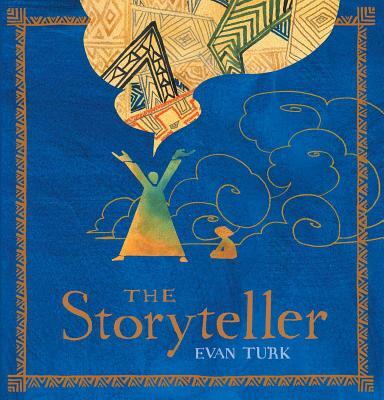 Acclaimed illustrator Evan Turk has created a stunning multidimensional story within a story that will captivate the imagination and inspire a new generation of young storytellers. Evan Turk is an Ezra Jack Keats Award–winning illustrator, author, and animator. He is the author/illustrator of The Storyteller and Heartbeat and the illustrator of Muddy: The Story of Blues Legend Muddy Waters, which was a New York Times Best Illustrated Children’s Book, Grandfather Gandhi, and its companion Be the Change. Originally from Colorado, Evan now lives in the Hudson River Valley with his husband and two cats. He is a graduate of Parsons School of Design and continues his studies as a member of Dalvero Academy. Visit him at EvanTurk.com.